The Bravilor Novo is the most popular office and restaurant filter coffee machine, worldwide. It features a double pot/ double heating tray system, as well as heat adjusting hot plate technology to prevent burnt coffee for up to 12 hours. The Novo also comes with two “almost” unbreakable hardened pyrex flasks with can hold up to 1.8 litres of filter coffee. Want to have something better than instant coffee without the cost of a cappuccino or hot chocolate type system. Unfortunately no machine is perfect – we wish they were. Below we list the pros and cons of the Bravilor Novo. Super Simple To Operate – Filter coffee machines are arguably the “easiest” of all coffee machines in terms of cleaning and operating. Literally, fill, pour and drink. Two Filter Pots – the Novo features two filter pots of 1.8 litres which gives about 3 times the capacity of most domestic filter units. 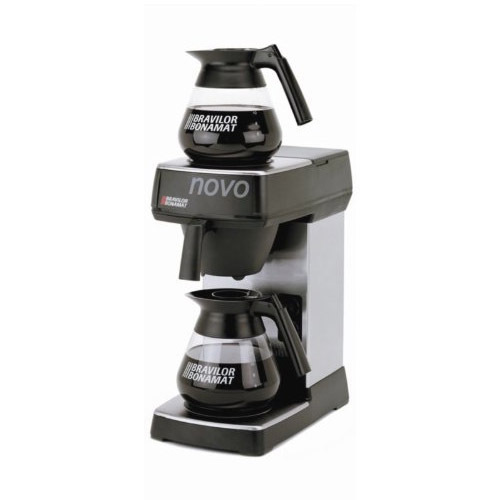 Heat Adjusting Hot Plates – The Novo is the only filter coffee machine on the market to feature heat adjusting hot plates which regulate the temperature applied to the coffee to almost eliminate the burning of coffee and the resulting bitter taste. No Fancy Drinks – A filter coffee machine solution is the cheapest of all coffee solutions with the exception of a simple kettle. However, the downside of simplicity is that there are no fancy drinks like cappuccinos, hot choc and lattes. Not as Fresh as Bean Coffee – Filter coffee prepackaged in sachets is better than leaving a whole packet open and depleting it one day at a time, however, it is still not as fresh as bean to cup. Old School – Filter coffee is, well, a little old school. If you are wanting a coffee machine to experience espresso and all things that come with it, then filter coffee is probably not the right fit for you.